Walt Disney World is filled with unique dining experiences and everyone has their favorite. The Sci-Fi Dine-In Theater at DHS offers a completely immersive atmosphere that simulates guests sitting in cars watching a movie at a drive-in in the 1950s. The Chef’s Table at Victoria & Alberts at the Grand Floridan takes elegance to the next level. Be Our Guest Restaurant at the Magic Kingdom allows guests to step into the world of Beauty & the Beast. At Kidani Village, Sanaa is filled with elements of African culture and allows guests to look directly out into the savannah. Where else can you dine in front of 5.7 million gallon aquarium outside of Epcot’s Coral Reef? We all have that special place. 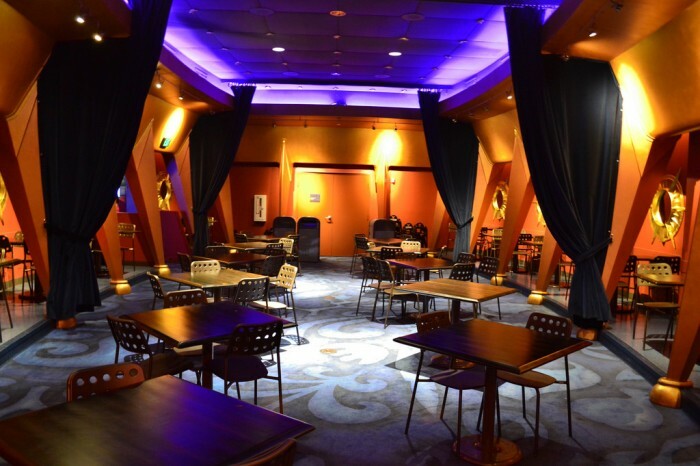 A venue that satisfies our craving for exotic food like Jiko…or where servers can have a bit of fun with guests like 50s Prime Time or Whispering Canyon… or where a couple can have an romantic evening out together like at Artist Point. Take a moment and mentally picture YOUR favorite place to have meal at Walt Disney World. Welcome to FoodQuest at Downtown Disney’s DisneyQuest. 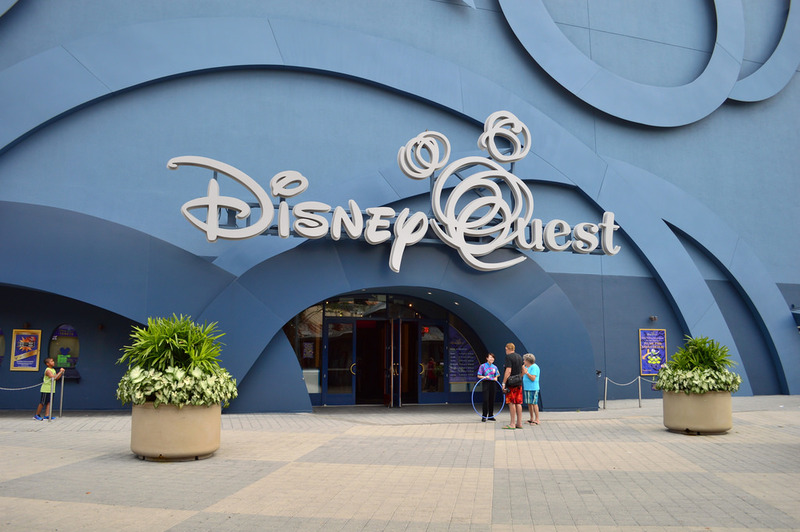 Located in Downtown Disney’s West Side, DisneyQuest bills itself as an interactive indoor theme park and promises five floors of fun. Personally I think the word fun should be in quotation marks or, in the spirit of Lionel Hutz, be followed by a question mark. 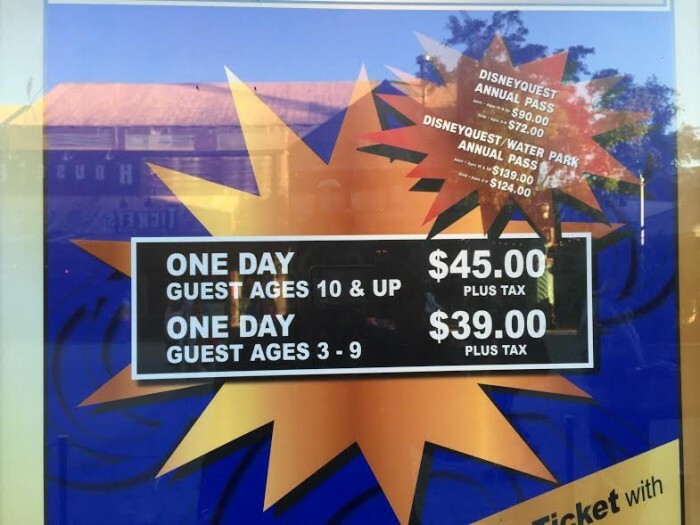 There is an entrance fee to enter, rather steep if you only want to go for one day, but admission is included with several Disney ticketing options, including the Premium Annual Pass. 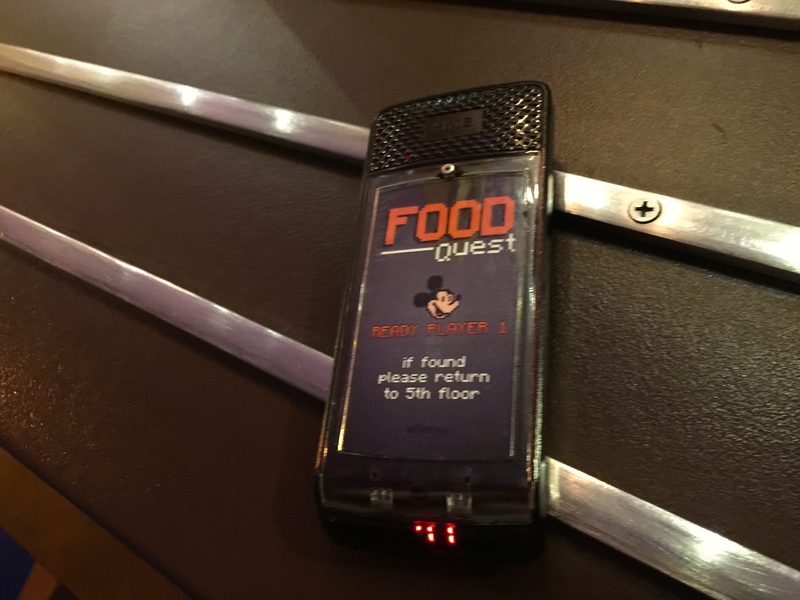 FoodQuest is located on the fifth floor of DisneyQuest, the penthouse if you will. Also located on the fifth floor is Invasion! An ExtraTERRORestrial Alien Encounter and various classic video games and pinball machines. There is plenty of available seating at FoodQuest. Eat your heart out Grog Grotto! 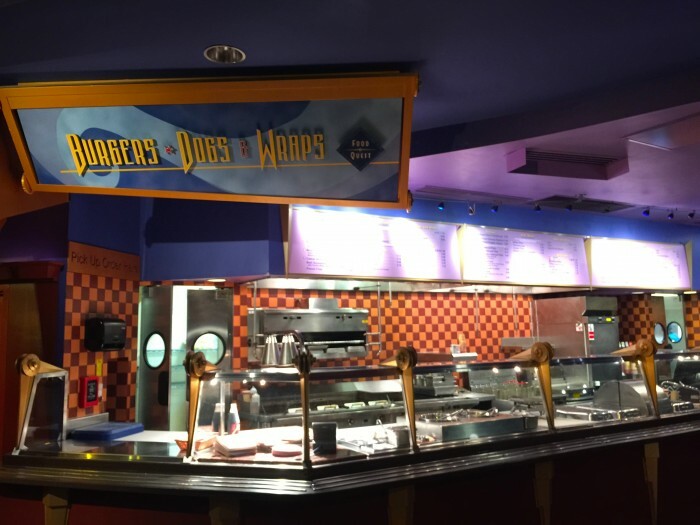 The set-up for FoodQuest is very similar to the food courts found at value resorts, except there is only one station you are ordering from. We went in to FoodQuest hoping to find some unique items. Imagine being able to tap into the world of video games to inspire your menu. Something with sausage “links” to reference Legend of Zelda. A blue milkshake for Sonic the Hedgehog. How many games use potions and elixirs that you could turn into signature drinks?! Unfortunately you will find little creativity here and it is one of the most generic menus on property. After guests order they are given a pager. I’ve always found this strange because there is never a wait at FoodQuest (in fact several times the staff seemed to be surprised someone wanted to actually order) and it’s not like the kitchen is making Duck à l’Orange or some complicated meal. Where exactly are you going to go while they cook a hamburger or make a turkey wrap? Credit where credit is due though, themed pagers? That’s great. Why can’t everyone have this? Trader Sam’s, we’re looking in your direction…. 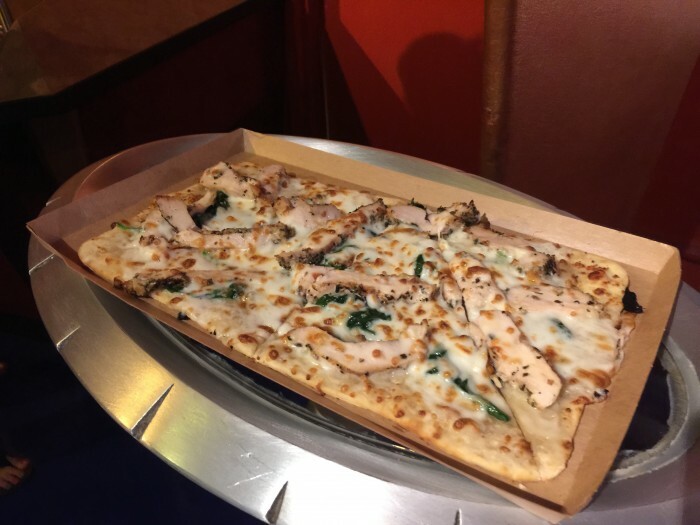 Our first selection is the Rock ‘n Chicken Flatbread Pizza. Flatbreads are the Frozen of the Disney food world, becoming ubiquitous across property. Here’s the thing though, most aren’t that bad. Or maybe the real pizza Disney was making was so atrocious that these seem good in comparison. Either way, flatbreads we get almost everywhere at WDW seem to pass the taste test and this was no different. You get a healthy serving size, and the chicken is much bigger than the little bits we expected to be sprinkled on. Next up was the Mixed Greens Salad. 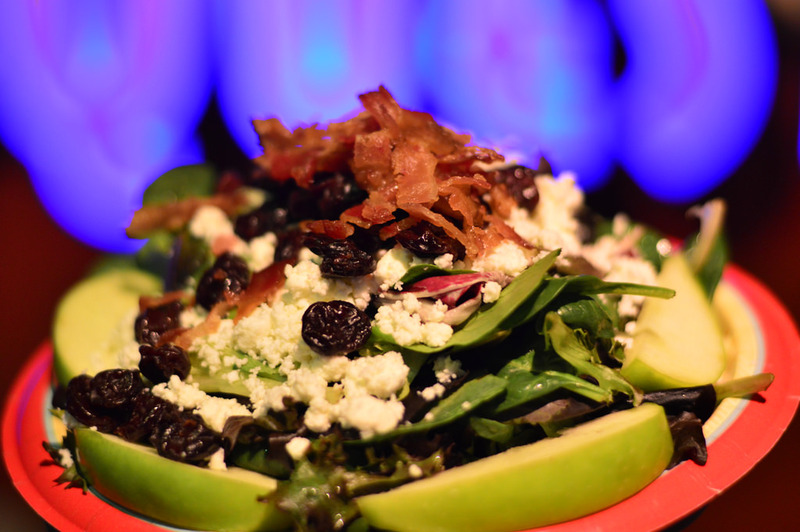 This is not your average mixed green salad as it involves green apples, dried cherries, feta cheese, bacon, a spring mix of lettuce and topped with vinaigrette dressing. Even though it seemed designed by a pregnant woman in her third trimester and was only missing a scoop of ice cream on top, this wasn’t that bad at all. Everything seemed fresh and outside of the dressing being very vinegar heavy, was edible. Desserts are your standard Disney fare. 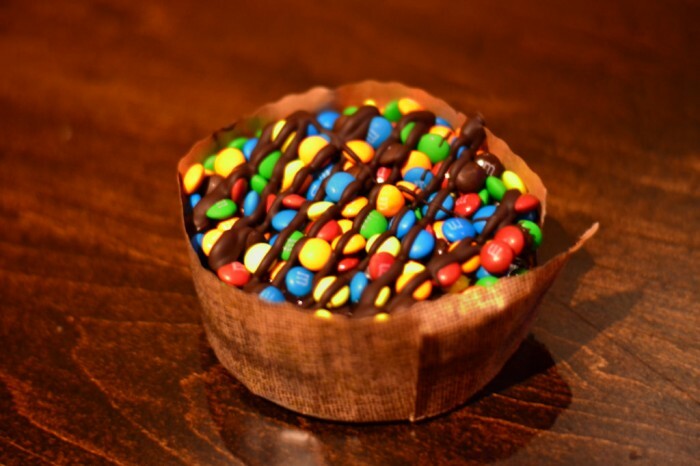 We went with the M&M Brownie. We don’t want to get too theological here, but if there’s a heaven, whoever invented this brownie deserves a FP+ past those pearly gates. 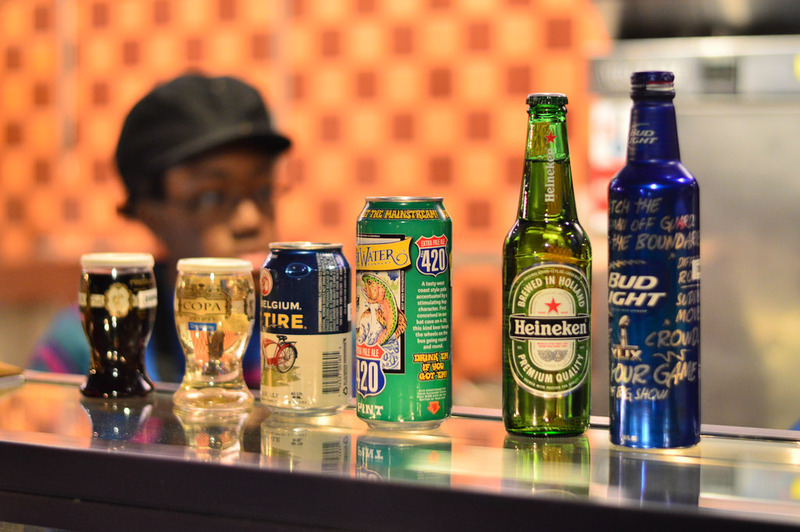 There is a limited selection of alcohol, and there are no draught beers. 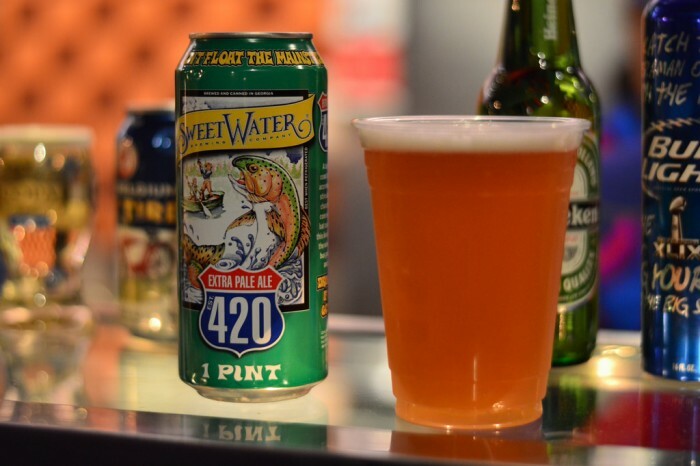 Went with Sweet Water Extra Pale Ale 420. A nice beer. A bit hoppy but enjoyable. Keep your head on a swivel when walking around DisneyQuest as there are some details worth checking out, like some Hidden Mickeys. 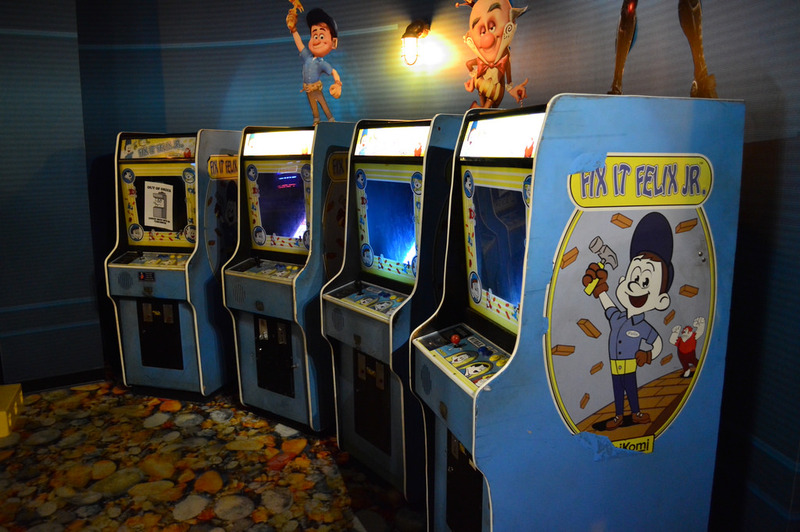 Fans of Wreck-It-Ralph should enjoy there is an area of DisneyQuest that has actual arcade cabinets featuring Fix It Felix Jr. Like all the arcade games they are set up for free play. Disney would be well served in putting these in the lobbies/arcades of some of its resorts like Pop Century, Art of Animation and The Contemporary (which has a shockingly awesome arcade). 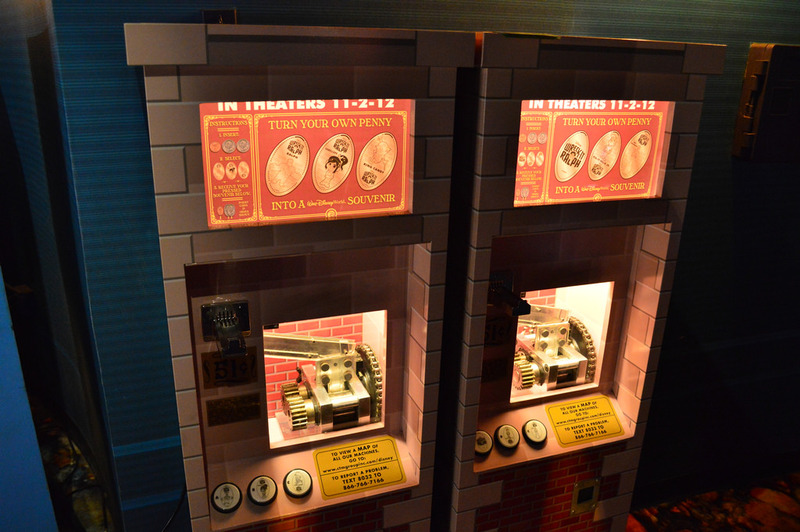 There are also Wreck-It-Ralph pressed penny machines. 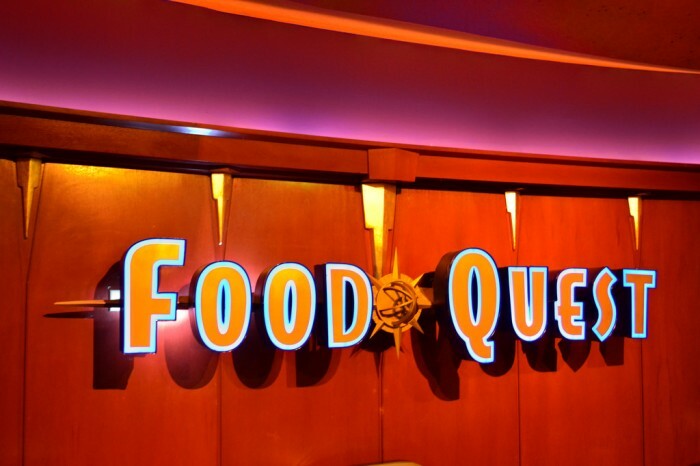 Overall thoughts: It’s hard to imagine why FoodQuest needs to exist in its current state because guests are now steps away from much better options. Not just restaurants like Splitsville and House of Blues, but quick service locations like the The Smokehouse or the food trucks in Exposition Park. It’s also clear that a big part of the transition from Downtown Disney to Disney Springs is the addition of some new restaurants such as the Boathouse and Morimoto Asia. Since FoodQuest isn’t particularly kid friendly, it just makes sense to leave and come back later to play some more games. The opportunity is there for this venue to become almost destination dining, sort of a millenial’s version of Trader Sam’s Grog Grotto, but as of now it is just another average quick service in an area that is becoming filled with much better places to spend your dining dollar. Special thanks to crack staff photographer Brandon Glover, Best Week Ever’s Daisey Lauren and Megan Stump for their invaluable assistance with this article. Be sure to also check out Brandon on The Park Blogger podcast with co-hosts Aengus Mackenzie and Brian Carey. 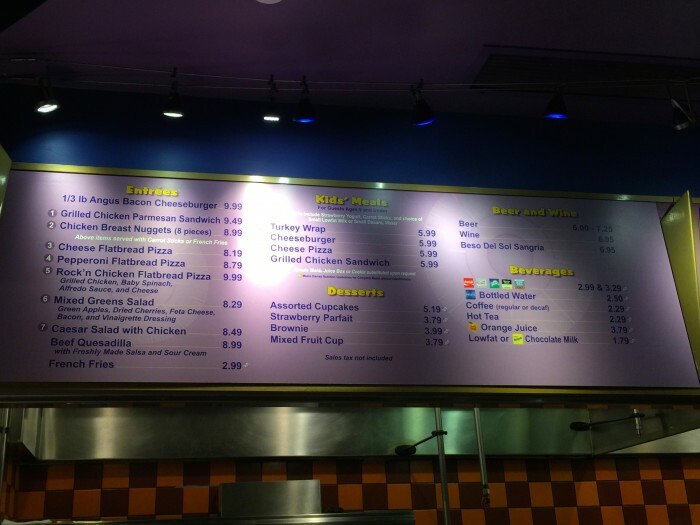 It’s been years since I’ve been to DisneyQuest, much less eaten at FoodQuest. Wow, this place has fallen in quality – I remember when the restaurant used to sell desserts made by Cheesecake Factory. 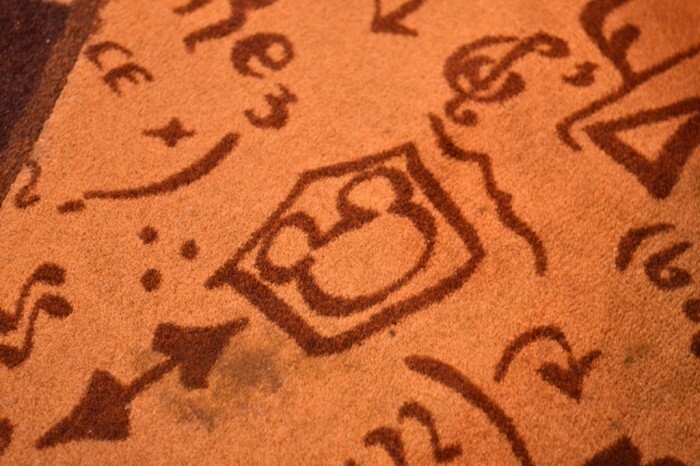 It’s obvious Disney hasn’t put much TLC in the place – I can’t imagine a carpet as dirty as the one photographed above being allowed to continue in that state at any of the theme parks. For the record – if you can get in free, the “Red Velvet” cupcakes are spectacular. And HUGE. We got a few with snack credits on the free DDP last time and brought them back to our hotel rooms for later. 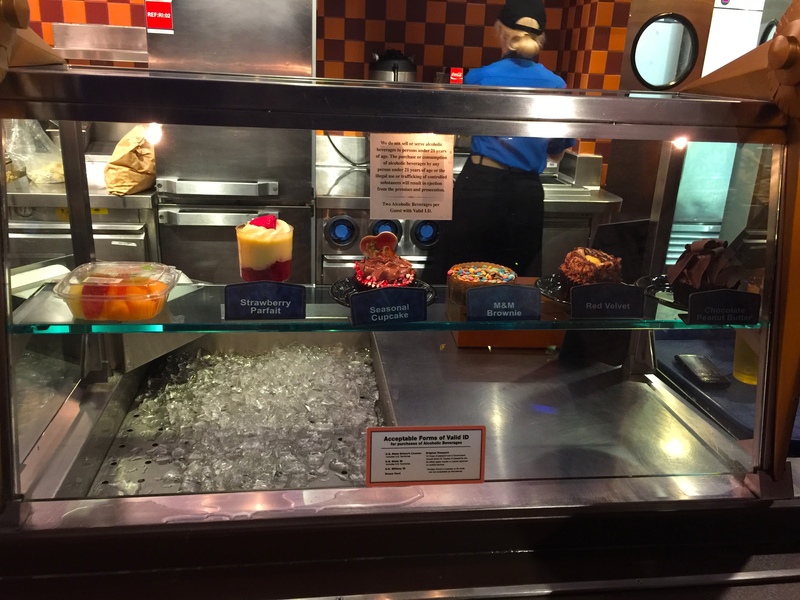 One area Disney exceeds in is snacks in general and cupcakes in specific. Yes DQ hasn’t received as much love as the parks and yet this place (including FoodQuest) is packed almost every time we go. They have made very small changes over the last 10 years we’ve been stopping there and some have been welcome but several have left us scratching our heads. Whether Cheescake Factory left or Disney moved them out doesn’t matter, Disney should have brought in another big name to fill the spot. They’ve updated some of the tech and they need to do more updates. I’ve never eaten here (and never will after reading this post), but your comments made me laugh, thank you!